The Mabinogion (Y Mabinogi) are a series of tales that are built from the myths and pseudo-historical accounts of Celtic Britain. These tales were passed on from storyteller to storyteller and the oldest written versions date from circa 1325 ('The White Book of Rhydderch') to the early 1400s in the case of the 'Red Book of Hergest'. 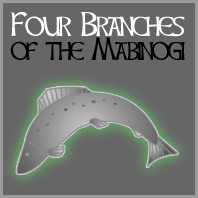 The four main tales 'Pwyll', 'Branwen', 'Manawyddan', and 'Math' are refered to as the Four Branches of the Mabinogion. Translated by Lady Charlotte Guest and published in 1849, there has been much speculation over its name. The word 'mab' means 'son', so Lady Guest concluded that Mabinogion meant 'tales for boys'. Another theory states that it is the title for the repertoire of the trainee Bard, who would have travelled the county visiting the great houses, holding the Princes, Lords and Ladies, spellbound with these tales. The Mabinogion provides us with an interesting, if dreamlike, glance into how the ruling classes of late Iron Age/Dark Age/Early Medieval Britons saw themselves, reflected in the lives of their heroes and their Gods. The characters are heroic, the tales mythic and sometimes surreal.